Sharp LC-52LE700 review | What Hi-Fi? Sharp has serious heritage in the AV industry, particularly when it comes to producing TVs. And yet, in recent years, its models have tended to find themselves marooned in mid-table mediocrity. Majoring in neither price nor performance, unmitigated recommendations for Sharp sets have recently been few and far between. Nevertheless, we approach this set with an open mind – only for old convictions to resurface with this LC-52LE700 model. First things first. The specification looks sparse compared with others we've seen. It's certainly devoid of some of the more exciting advances to hit the latest generation of TVs. There's no HD tuner for example: this set makes do with standard-definition Freeview. The lack of 3D support is understandable (it's not alone there), but an absence of any streaming or internet applications is more of a shame. Even the USB input is for still images and audio only – not video. Instead we're left to settle for some more familiar specifications. There's full LED backlighting, 100Hz motion processing and of course a 1920 x 1080 Full HD resolution with support for 24fps content. This is also a big set, squeezing another two inches on to the screen's diagonal measurement. Out of the box we can't help but feel it's more of the same. It's an angular, matter of fact design, less alluring than the sleeker rivals. The remote is an uninspiring affair (our photographer had to check that this was the right remote for a £1200 TV), and with it, you have to navigate the Sharp's strangely dated interface. Undeterred, we press on and hope for better in terms of pure picture performance. And in truth, that's what we get. The Sharp produces a Blu-ray picture that has plenty to offer: remove the digital noise with Sharp's noise reduction setting and the Freeview tuner delivers decent black levels that are solid and dark, if lacking in a little detail at times. Motion is handled competently, too. 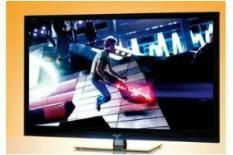 No screen is perfect and while there's no option for the super-smooth yet slightly unreal (and not without flaws) processing that other TVs offer, this Sharp's delivery of motion is fairly trouble-free. The scaler, though, is a little less accomplished. Asked to make the DVD of Bad Lieutenant fit the screen, and there's a lack of sharpness and detail recovery compared with others, while colours are drawn in broad strokes. Standard-definition Freeview can be similarly crude, marred by instability and soft edges. Consider that the sound is no more than average, and we start to lose the positive vibes about this set. The picture performance, then, is good in parts, but let down when watching standard-definition content. All told, there are too many holes in this Sharp's armoury for our liking.